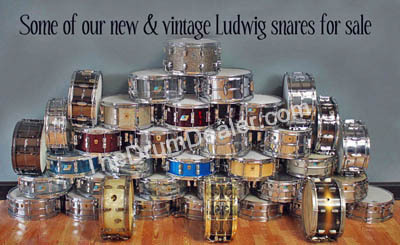 Ludwig drum dealer selling discount drum kits, snares and components. A division of Rock N Roll Vintage Inc. Welcome to TheDrumDealer, your favorite Ludwig drum and Zildjian Cymbal shop. We're a division of Rock N Roll Vintage, an authorized Chicago Ludwig dealer selling Ludwig Drums online and in our Chicago vintage guitar store. Here you'll be able to talk to drummers who are not only passionate about percussion but who also play Ludwig and Zildjian exclusively. In addition to selling Ludwig online we also have a real brick and mortar store on Chicago's North side (click here for a map). Given Ludwig was founded in Chicago we have a special home town respect for Ludwig Drums and accessories. Ludwig is known for innovation and quality and one of the most popular drum manufacturers today. Ludwig is the only drum brand we sell. 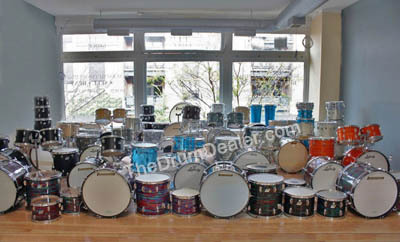 Please note we are Chicago based Ludwig Dealer and we do not sell Ludwig drum kits outside the USA. We specialize in Ludwig Drums, Kits, Custom configurations, Zildjian Snares and closeout kits online and in our Chicago shop. We're not one of those super stores, you will find we're knowledgeable friendly and easy to work with. Rather than stock loads of Ludwig drums and charge you for high overhead our philosophy is to place factory orders for most drums and snares and pass the savings along to you. Rest assured if you live in the USA we can provide any Ludwig drum, snare or drum kit available. We also price match ! Please note we do not carry Ludwig parts. Want a quote or need to place an order ? Drop us an email at sales@TheDrumDealer.com or call our shop at 773-878-8616 for the latest Ludwig closeouts or to place your factory kit or component order. See our ordering and quotes details page We will do everything we can to earn your business. We appreciate the history and culture of Ludwig Drums and we're fortunately to be located in the city where it all began. Recently we shot a Ludwig natural maple kit on the rooftop of the original Chicago Ludwig Factory. Ludwig liked it so much they used it in a recent drum catalog! Rock N Roll Vintage Inc. is a member of Chamber of Commerce, is a Paypal Verified Business and registered with the City of Chicago. TheDrumDealer.com a division of Rock N Roll Vintage Inc. Copyright 2017 - All trademarks are property of their respective owners.